Fig. 1. (A) Experimental design of a threshold-level auditory stimulus presented on top of background scanner noise at very long, unpredictable interstimulus intervals (ISI, 20–40 s). Participants listened for the faint target sound continuously throughout 20-min runs and pressed a response button whenever they perceived the target. (B) Illustration of baseline time segments unaffected by evoked responses that were defined as appropriate for analysis of ongoing functional connectivity (marked in gray). The illustrated blood-oxygen-level-dependent (BOLD) hemodynamic response peaks at 6 s, reaches maximum poststimulus undershoot at 12 s, and returns to baseline before 16 s relative to stimulus onset according to finite impulse response estimation of the brain response to this stimulus in the same data in 10 bilateral brain areas (12). Baseline segments started after 16 s poststimulus and ended 1 s after the next stimulus onset. Baseline segments shorter than 6 s in length (interstimulus interval <22 s) were excluded. For classification analyses requiring trial by trial data, data were further restricted to baseline segments that were at least 15 s long (10 image volumes and interstimulus intervals ≥31 s). In this exemplary 2-min period of the task, four stimuli (marked as solid vertical lines) occur at interstimulus intervals of 40 (maximum in this design), 20 (minimum), and 32 s. Note that, for simplification, this illustration does not depict the spontaneous signal fluctuations during the baseline period and the ensuing variability in stimulus-evoked hemodynamic responses that are at the heart of this study. Credit: Sadaghiani S et al. (2015) Ongoing dynamics in large-scale functional connectivity predict perception. Proc Natl Acad Sci USA 112(27):8463-8468. The brain is an exceedingly complex and active organ in which most neural activity is not directly evoked by, and thereby linked to, specific external events. Moreover, intrinsic activity occurring in one location exhibits functional connectivity – that is, being correlated with other brain regions – but there has been only limited direct evidence of these continuous large-scale connectivity dynamics having behavioral relevance. Recently, however, scientists at University of California, Berkeley demonstrated that these ongoing changes correlate with behavior by using functional magnetic resonance imaging (fMRI). The researchers conclude that moment-to-moment changes in baseline functional connectivity may shape subsequent behavioral performance. Their findings suggest that a highly modular network structure is beneficial to perceptual efficiency. Dr. Sepideh Sadaghiani discusses three key strategies that she and her colleagues applied in their research, which was published in Proceedings of the National Academy of Sciences: using fMRI to show that strength and spatial organization of functional connectivity correlate with behavior; using multivariate classification of functional connectivity before the target stimulus to predict whether it was perceived or missed; and using graph theoretical measures to characterize the difference in functional connectivity between states that lead to hits vs. misses. "Over the past decade a major paradigm shift has become increasingly apparent in the cognitive neurosciences," Sadaghiani tells Medical Xpress, "in which we've come to acknowledge that most of the brain's neural activity occurs spontaneously rather than in direct response to an external event or stimulus. However, although the largest proportion of brain activity is intrinsic rather than evoked, the vast majority of neuroscience experiments have been investigating the neural response evoked by controlled experimental stimuli. This common approach has left unanswered the fundamental question of the functional relevance and raison d'être of spontaneously occurring ongoing activity." In short, the brain spends an enormous amount of energy in constantly maintaining this ongoing neural activity – so, she asks, what is its functional purpose? "To understand the impact of ongoing brain activity on cognition and behavior, we must inevitably study consequences of this spontaneous activity while participants perform a task," Sadaghiani continues. "The exponentially growing body of fMRI studies investigating ongoing activity during a task-free resting state has provided key insights into this activity's spatiotemporal structure." For example, she illustrates, resting state studies have revealed that ongoing activity is correlated across distant brain regions forming functional connectivity networks, and that this functional connectivity is not static but dynamically varies in strength and spatial distribution over seconds to minutes. "However," she points out, "resting state studies obviously don't allow us to understand how the continuously changing spatiotemporal structure of ongoing brain activity and connectivity impacts behavior from moment to moment." That said, Sadaghiani acknowledges that studying ongoing activity and connectivity during task performance is very challenging because the task stimuli themselves evoke brain responses that interact nonlinearly with ongoing brain activity. (In nonlinear interaction, there is not a proportional increase and/or decrease between the independent and dependent variables, which makes it difficult or impossible to calculate or separate the two.) "In the presence of such interactions, we can't tease apart ongoing brain activity and the impact it may have on behavior – a problem stemming primarily from fMRI's low temporal resolution." The conundrum is that the attempt to visualize activity in large-scale functional connectivity networks spanning the entire brain requires the use of fMRI, as opposed to neuroimaging methods with higher temporal but poor spatial resolution, such as electroencephalography (recording the brain's electrical activity along the scalp by measuring voltage fluctuations resulting from ionic current within the brain's neurons) and magnetoencephalography (mapping brain activity by recording magnetic fields above the scalp produced by electrical currents occurring when neurons are active). "The fMRI signal change elicited by the neural response to a stimulus reaches its peak about six seconds after the actual neural response, and takes an additional 10 seconds or so to return to baseline," she adds. "Therefore, unless the task-related stimuli are very far apart from each other, we cannot study ongoing brain activity unaffected by these evoked responses." It turns out that this is especially true of ongoing functional connectivity, as it requires the calculation of cross-region activity correlations over many consecutive time points unaffected by evoked activity. Fig. 2. (A) Intrinsic functional connectivity networks derived from seed-based correlations in an independent resting-state session (12). (B) Difference in cross-correlation for pre-hits > pre-misses. Each data point corresponds to a paired t test (uncorrected) between the two respective regions. Connections passing P < 0.02 (uncorrected) are marked in black in the lower triangle of the matrix to exemplify the features used for subsequent classification analyses (from similar difference matrices leaving one trial out) (Methods). Of note, all 12 connections corresponded to connectivity with DM or AUD networks. dACC, dorsal anterior cingulate cortex; dlPFC, dorsolateral prefrontal cortex; FEF, frontal eye fields; IPL, inferior parietal cortex; IPS, intraparietal sulcus; L, left; LP, posterior lateral parietal cortex; mPFC: medial prefrontal cortex; MT+: middle temporal area; Paracingl, paracingulate cortex; PCC, posterior cingulate/precuneus; R, right; rlPFC, rostrolateral prefrontal cortex; Thal, thalamus. Credit: Sadaghiani S et al. (2015) Ongoing dynamics in large-scale functional connectivity predict perception. Proc Natl Acad Sci USA 112(27):8463-8468. To address these challenges, Sadaghiani recounts, the scientists spaced the task-relevant stimuli much further apart than what is typical for fMRI studies, allowing them to study trial-by-trial ongoing functional connectivity unaffected by the slow fMRI signal change in response to the previous stimulus. "The stimuli were presented only every 20-40 seconds, and we analyzed ongoing functional connectivity only after the fMRI response to the previous stimulus had subsided. We then asked how the percept of an identical sound stimulus differed depending on the functional connectivity state just prior to that sound. Since spacing stimuli this far out results in much fewer trials per subject, we pooled information across the full group of subjects in a machine learning procedure to predict the next percept in each trial based on pre-stimulus ongoing functional connectivity." Sadaghiani also addresses the study's central finding, which suggests that moment-to-moment dynamic changes in baseline functional connectivity may shape subsequent behavioral performance and contribute to explaining behavioral variability. "We commonly experience that our behavior is inherently variable – for example, we may react differently to an identical image, odor or sound from one moment to another. In this experiment, participants were asked to press a button whenever they heard a particular target sound, which was presented at each participant's detection threshold volume such that they heard only about half of the targets." Since the stimulus and the experimental environment were identical from one trial to another, the difference in perception and performance – that is, whether the sound was heard or not –could only be attributed, the researchers reasoned, to the difference in brain state at the moment at which the sound was played. "A crucial characteristic of the brain that dynamically and spontaneously changes from moment to moment is the functional connectivity state of its large-scale networks," Sadaghiani explains. "We therefore compared the ongoing functional connectivity state of the brain immediately prior to playing a sound that was, of course, either heard or not heard, while paying attention to particularly important differences, such as the networks to which the task-relevant auditory brain regions were connected. Indeed, we found that the brain's ongoing functional connectivity differed between these two states." Given this difference, the researchers were then able to look at the functional connectivity before each sound and predict with above-chance accuracy whether or not the participant was going to hear the next sound. In other words, the dynamic changes in prestimulus functional connectivity explained variability in subsequent perceptual outcome. "Although we can't draw definitive causal conclusions, these observations strongly support the idea that ongoing functional connectivity – that is, spontaneous long-distance communication within and across brain networks continuously influences our perception." The scientists also found that the relation of behavior to prestimulus connectivity was dissociable from that of prestimulus activity amplitudes, with their data suggesting that the behavioral relevance of connectivity dynamics goes beyond the sum of distributed amplitude fluctuations of regional brain activity. "Previous research – including our own earlier work – had shown that the amount of neural activity in a given task-relevant region or network fluctuates over time, and that this baseline activity level prior to a given trial predicts the subsequent perceptual outcome on that trial," Sadaghiani says. "However, we know that beyond the amount of ongoing activity, the degree with which this ongoing activity is correlated across brain regions also changes from moment to moment – but whether this correlation or functional connectivity influences behavior over and above the impact from the amount of ongoing activity had been an open question that we have now answered in our current work." The paper describes how a highly-modular network structure likely benefits perceptual efficiency. "We sought to further understand what exactly characterized the difference in functional connectivity or network communication prior to successful versus unsuccessful detection," Sadaghiani notes. By modeling the brain as a graph – with brain regions as nodes and their connections as edges – the scientists were able to see whether any global and whole-brain characteristics of this difference were identifiable. "We found that, in general, individual brain networks, which were represented as graph modules, were less strongly segregated from each other during moments that led to missing a sound." In graph theory terms, she explains, this means that we are less likely to perceive faint stimuli when the brain is in a less modular, more integrated state. Fig. 4. Graph construction and graph modularity. 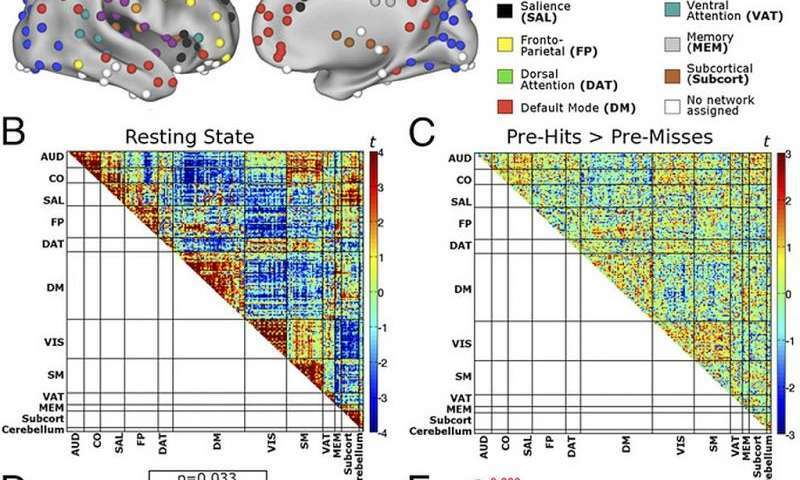 (A) Nodes from a functional atlas defined on the combined basis of resting-state functional connectivity and a meta-analysis of cognitive tasks (1). (B) Resting-state correlation pattern across the nodes. This pattern with strong connectivity within the atlas modules shows that the predefined modular partition structure of the atlas reflects the data structure well. (C) Difference in functional connectivity of pre-hits baseline > pre-misses baseline (compare with Fig. 2B). Difference between task and resting state is in SI Text, section 7 and Fig. S5. (D) Graph modularity was reduced before misses compared with hits and task-free resting state. P values are Bonferroni-corrected. (E) A visual representation of the modularity difference before hits vs. misses for a representative individual participant (cost 0.05). This representation is generated by a force-field algorithm that treats nodes as magnets repulsing each other, whereas edges act as springs attracting the nodes that they connect (37). The configuration onto which these forces converge is visibly more modular before hits compared with misses. Networks (modules) are colored as in A. Most notably, DM (red) and VIS (dark blue) modules are less segregated from the rest of the graph before misses. (F) Contribution of individual modules to overall graph modularity. The strongest contribution to modularity difference was from DM and VIS networks. All error bars show SEMs. n.s., not significant. Credit: Sadaghiani S et al. (2015) Ongoing dynamics in large-scale functional connectivity predict perception. Proc Natl Acad Sci USA 112(27):8463-8468. The paper raises the fundamental question of why the brain's processing architecture constantly undergoes such spatially extended modulations, as well as the possibility that in more complex decision-making or working memory engagement, behavior would benefit from less modularity and thereby more widespread communication between task-relevant modules. "While in the recent few years it has become increasingly apparent that ongoing functional connectivity across brain regions is constantly changing, the reason for these dynamics is largely unknown," Sadaghiani notes. "One interpretation is that these dynamics could be merely an epiphenomenal byproduct of how spontaneous electrical activity flows through the brain's anatomical wiring – but another much more exciting possibility is that by dynamically shifting between various connectivity states, the brain iterates through connectivity layouts that facilitate different types of cognitive functions. For example," she illustrates, "one moment the brain may be in a state that is optimal for sensory perception, such as a highly modular structure where sensory networks are well segregated as observed in the current perceptual experiment. In the next moment, the brain may be in a more integrated state where widespread communication across networks facilitates higher-level cognitive functions such as semantic memory retrieval or complex reasoning." This interpretation suggests that by continuously changing configurations within an array of connectivity states, the brain could exploit its full cognitive potential. The paper also states that attempts to link behavior to brain function must conceptually integrate the role of ongoing brain activity and its connectivity dynamics. "Almost all neuroscientific approaches to studying the neural basis of cognitive processes – from single cell recordings to large-scale network imaging – inherently assume that the brain is primarily a reactive machine and mainly fires in response to a stimulus or cognitive challenge." Sadaghiani says. "While this assumption greatly simplifies experimentation and analyses, during the last decade or so overwhelming evidence across all these methodologies shows that most of brain activity is in fact intrinsic and not dependent on external events. In fact, a growing body of studies – including ours – suggests that this intrinsic brain activity influences our perception of the world and cognition." Interestingly, she comments that, conceptually speaking, this is not a new idea. "In the words of William James, 'Whilst part of what we perceive comes through our senses from the object before us, another part (and it may be the larger part) always comes out of our own mind' – and while the existence of intrinsic ongoing brain activity is not debated among neuroscientists, we need to start integrating the nonlinear interaction between intrinsic and evoked brain activity in our models and analyses of the neural basis of cognition." Fig. 5. Nodal graph measures. 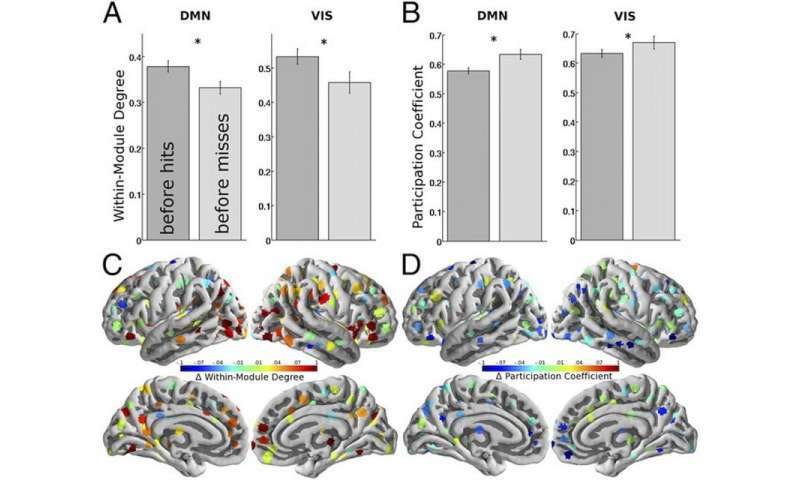 In both the DM and VIS networks, the previously observed loss of modularity before misses was driven by both (A) a decrease in within-network connectivity as measured by within-module degree and (B) an increase in across-network connectivity as measured by participation coefficient. Across the whole brain, decreases in modularity before misses coincided with (C) decreased within-module degree in many but not all nodes and (D) a more global tendency toward increased participation coefficient. Error bars show SEMs. *Significant at P < 0.05 after Bonferroni correction. Credit: Sadaghiani S et al. (2015) Ongoing dynamics in large-scale functional connectivity predict perception. Proc Natl Acad Sci USA 112(27):8463-8468. In terms of the scientists' research plans, Sadaghiani tells Medical Xpress that their functional interpretation regarding the reason for connectivity dynamics, described above, needs to be tested in future experiments that involve higher cognitive functions that can be contrasted with their current results from simple perception. "Furthermore," she adds, "to understand how network connectivity dynamics impact neural information processing, we will be recording fMRI simultaneously with electroencephalography, which measures electrical brain activity at real-time temporal resolution." In terms of other areas of research that might benefit from their study, Sadaghiani says that aberrant large-scale network communication plays a critical role in many psychiatric and neurological disorders – and changes in ongoing functional connectivity have been reported in these disorders. "For example," Sadaghiani illustrates, "schizophrenia is essentially described as a 'disconnection syndrome' – so understanding the influence of ongoing network connectivity on cognitive functions in the healthy brain is crucial in characterizing why abnormal network connectivity in the diseased brain leads to abnormal behavior." The nutrient-dependent cell type differentiation in all cells of all individuals of all species with organized genomes is controlled by RNA-mediated gene duplication and RNA-mediated amino acid substitutions in the context of the physiology of reproduction.